Football clubs across Wales could be under threat of relegation if they do not meet pitch standards by April 2020. 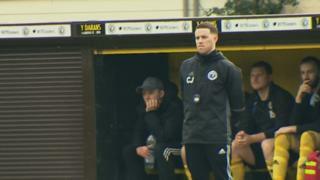 Clubs which compete in the third tier of Welsh football must conform to new Football Association of Wales (FAW) rules, which include pitch sizes. But two north Wales clubs said their grounds are not wide enough - and extending would be difficult for one and impossible for the other. The FAW said it invested "a significant amount" to help clubs. Llanberis FC's chairman Eurwyn Thomas said: "This is the most worrying time in the club's 130 year history." Llanberis in Gwynedd is separated from Llanrug by just four miles (6.5km) - and both clubs have been competing in the Welsh Alliance League for years. Their rivalry is under threat as neither of their grounds' measurements is wide enough to conform to the new regulations. The FAW said the criteria "are designed to raise standards, to make grounds more comfortable and safer". Llanrug's ground, Eithin Duon, is 7m short in width of the minimum allowable 62m and, according to secretary Emyr Jones, there is no room to extend. Llanberis has a row of houses at one side of the ground, and a busy road on another, so expanding would also be difficult. Manager Carwyn Jones said: "Llanberis FC has been running since 1890 and has always aimed to play at the highest standard possible. "Perhaps these new criteria now means the club will have to take a step back because our ground is about three or four metres too short. "As a club we are disappointed as it doesn't look at the moment as if we will satisfy the new regulations." The stadium must also be equipped with a public communication system and a seated area for 100 spectators by the 2021-22 season, along with ensuring there is parking for at least 10 cars. Mr Thomas added: "Building a new stand for more spectators isn't something the club would ever consider, as most weeks we don't get 100 people through the gate." The FAW said the vast majority of clubs had embraced the criteria and were working to meet them by 30 April 2020. It said it recognised the major financial challenge but had invested £600,000 into third tier clubs between 2016-18, with more investment planned as the deadline approaches. Meanwhile Monmouth Town FC's plans for a 250-capacity terrace in order to meet the new standards were recommended for approval by the town council last week.